San Diego County Employees’ Charitable Organization will mark 60 years of giving with a “Rock Around the (Lunch) Clock” celebration on Friday, Aug. 26 at the County Operations Center. The ‘50s-inspired festivity, a throwback to when CECO first formed, will include food, a live band, and “fun”-raising! There’s never been a better excuse to treat yourself! A portion of the food sales will go directly CECO. Get a Rubio’s taco plate with two tacos, rice, beans and chips, plus a bottle of water and two opportunity drawing tickets for just $10. Gobble up this deal now by RSVP’ing for the event online. A limited number of meal tickets will be available for sale the day of the celebration, but are first come, first served. After lunch, stay cool with dessert. Pinkberry will be selling cups of their sweet treat. All purchases will be cash only. The headliner of the summer celebration is a live band. Dona & the Servicemen will perform hits from the ‘50s. All members of the band are veteran musicians with years of stage experience and also happen to be Community Services Group employees. 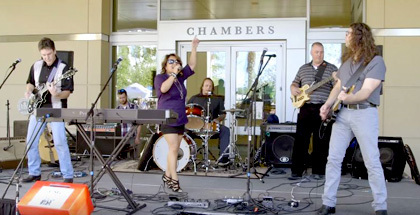 You may remember Dona & the Servicemen from the County’s 2015 Battle of the Bands, which benefited the March of Dimes. They are Jerry Benson, bass (General Services); Dona Debniak, lead vocals (Department of Animal Services); Brian Hagerty, guitar/vocals (Community Services Group Executive Office); Michael Hoag, drums (General Services ); and Eric Nedelman, guitar/vocals (Purchasing and Contracting). In addition, you could win big. CECO will sell opportunity drawing tickets for gift cards, Padres tickets and more. Don’t miss a single bite, note or opportunity drawing! Rubio’s taco plates and sales of Pinkberry will run from 11:45 a.m. to 1 p.m. The band goes on at 12:10 p.m. Come party like it’s 1956! Through County employee donations, CECO has distributed more than $6.7 million throughout the San Diego region to local non-profit organizations and employees in crisis since its founding in 1956. Make a one-time donation by emailing your CECO Department Representative or a member of the CECO Executive Committee. Sign up for a biweekly paycheck deduction for as little as $2 per pay period via Employee Self-Service. See CECO Pledge Instructions for details. To help with an upcoming fundraiser event, please contact your CECO Department Representative or a member of the CECO Executive Committee. Shop AmazonSmile and a portion of your purchase will be donated CECO. Learn more. Volunteer your time. Contact your CECO Department Representative or a member of the CECO Executive Committee.